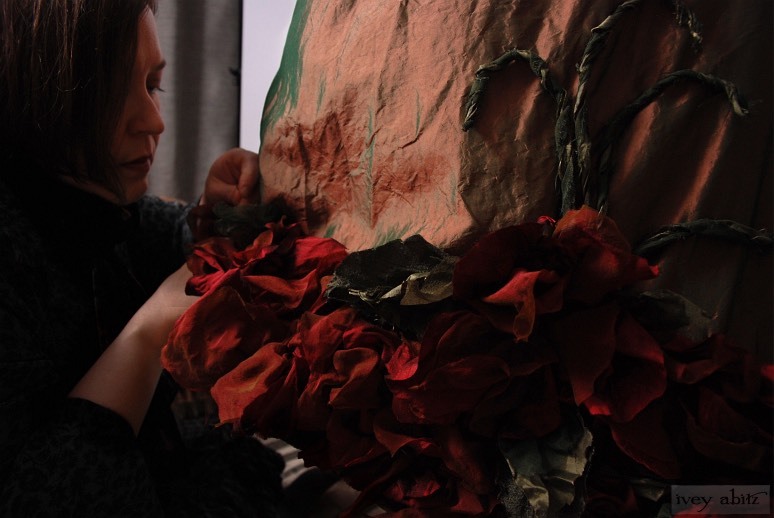 Artist Cynthia Ivey Abitz sews hand sculpted floral embellishments onto one of two gowns to be worn by Carolyn Hennesy at the 45th Annual Daytime Emmys Awards. Ivey Abitz created museum quality gowns for Carolyn Hennesy to wear at the Emmy Awards. This is a glimpse into the creative process. 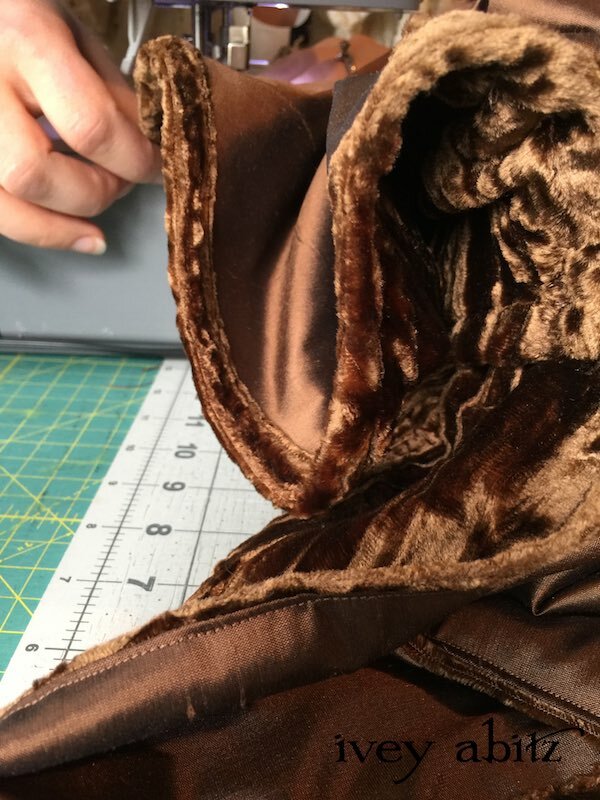 Ivey Abitz has designed two formal gowns for Emmy winning actress Carolyn Hennesy to wear as she hosts red carpet interviews and presents an Emmy award at the 2018 Daytime Emmy Awards. Carolyn regularly wears Ivey Abitz bespoke clothing for television interviews, red carpet events, and everyday life. When she was asked to host two red carpet pre-shows before Emmy Award ceremonies in 2018, she turned to Ivey Abitz for one-of-a-kind gowns. Here is Carolyn announcing that Ivey Abitz is making her Emmy Awards gowns on Hallmark Channel’s Home & Family. 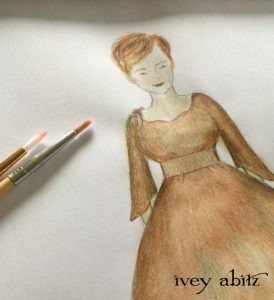 Cynthia Ivey Abitz, the designer of Ivey Abitz bespoke clothing, began the Emmy dress design process with paintings of her ideas. From that initial group of paintings, Carolyn began envisioning which designs she would wear in her role as a red carpet host. Together, they narrowed down the options to two resplendent gowns — one for the 45th Annual Daytime Creative Arts Emmy® Awards ceremony on Friday, April 27, 2018, and one for the 45th Annual Daytime Emmy® Awards on Sunday, April 29, 2018. Emmy Dress painting for Carolyn Hennesy, designed by Cynthia Ivey Abitz. In addition to these two formal Emmy gowns, Carolyn needed ensembles to wear to less formal events taking place around the main Emmy Award ceremonies. She chose several ensembles from the Spring 2018 Collection Look Book. Cynthia designed both Emmy Awards gowns with Carolyn in mind: her kind spirit, great sense of humour, appreciation of detail, and unpretentious regality informed her as she put paintbrushes to paper. The palettes and textures of the gowns were also designed to complement Carolyn personally. 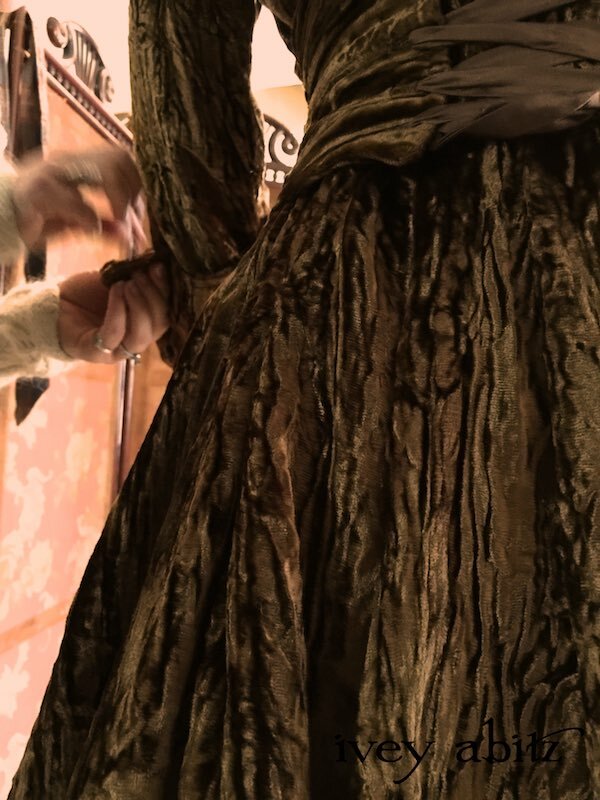 The unique personal rapport between Carolyn, the artist who acts, and Cynthia, the artist who designs, inspired one-of-a-kind ensembles that would showcase the actress’s authenticity. 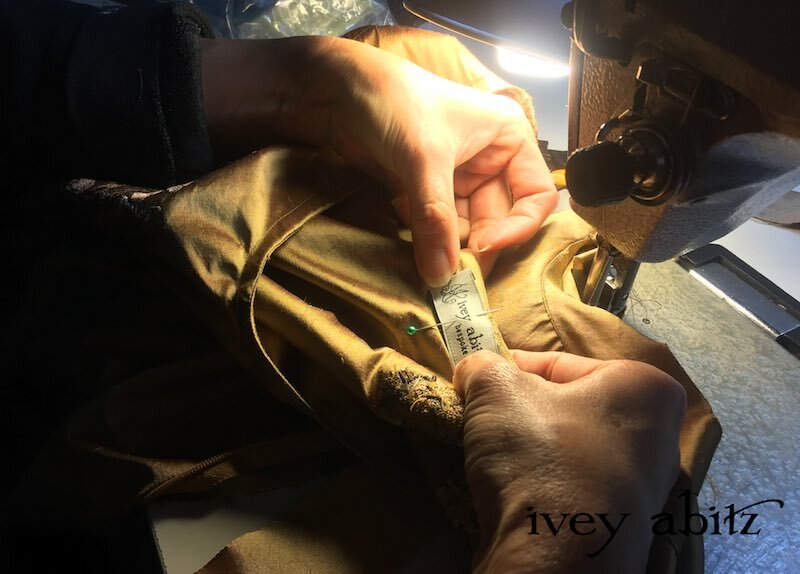 Cynthia strives to give such personal consideration to all Ivey Abitz clients through every seasonal collection, and it’s especially important when designing for such spotlight dresses as Emmy Awards gowns. Three of Ivey Abitz’s tailors–Kaye, Monika, and Truc–used their wonderful stitching to help Cynthia complete her vision for the gowns. All told, the process took weeks to complete and deliver in time for the Emmy Award ceremonies. The Emmy Awards are being viewed in new and innovative ways this year to reach an even bigger international audience. Friday’s ceremony will honour the creative arts like lighting and art direction. Sunday’s ceremony will honour actors and hosts of daytime shows. The 45th Annual Daytime Creative Arts Emmy® Awards on Friday, April 27. The 45th Annual Daytime Emmy® Awards on Sunday, April 29. As the red carpet host at both events, Carolyn will wear Ivey Abitz gowns created just for her. View it all live, with the pre-show beginning at 8pm EST on Friday evening, April 27.